When it comes to health is opening innovation just an option or a necessity? We asked to a group of policymakers, practitioners, analysts and solutions developers to share their insights. 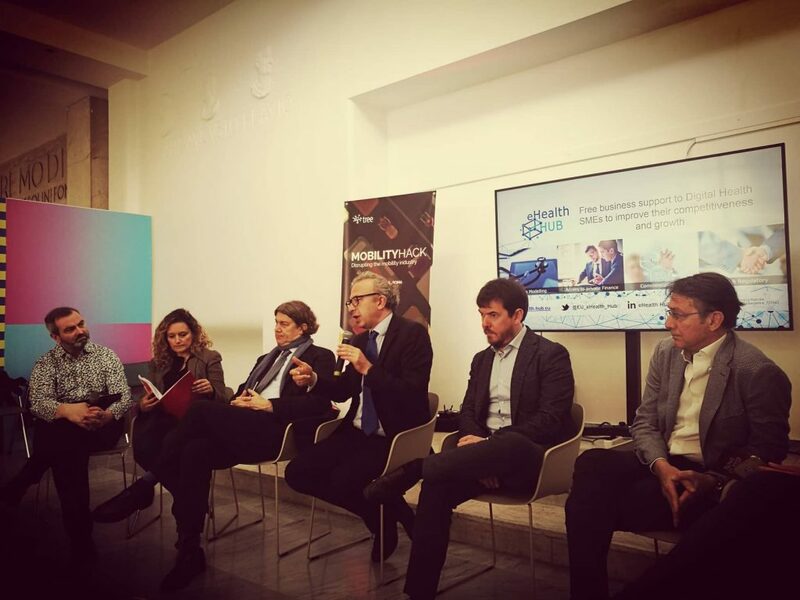 In the middle of the discussion, hosted at the Rome Startup Week, our eHealth HUB Solution Match model, based on a personalized service for health care providers. The Ospedale Pediatrico Bambino Gesù (OPBG) Solution Match was in fact launched, for scouting a remote controlling system able to meet a specific need from the largest European paediatric hospital. (Here the OPBG Solution Match open till 27 September). last but not least, patients with their own needs, rights, expectations and a certain degree of “consumer” power. shared commitment to the happy end of the story: better healthcare for all (where “better” stands for more efficient, effective, accessible, patient-driven). Straight to the point, Roberto Ascione, CEO at Healthware Group says: “We believe open innovation is the only way to innovate in health: disruptive will come from the small – medium sized”. Interesting point from Mauro Draoli, Head of Procurement strategies and market innovation at AgID (Agenzia Italia Digitale), remarking as half of innovative procurement regards ehealth innovation. “Public agencies are keen to improve the usage of new ways of procurement or develop a proper usage of the existing ones. We are fully aware we can’t do this without a strategic dialogue with the ecosystem”, he states. “We must, at any stage of the process, be aware that innovation should be creating new value”, says doctor Alberto Tozzi, Chief Innovation Officer at Ospedale Pediatrico Bambino Gesù. ”Open innovation in healthcare should be aimed at offering new solutions to all, making them available on the market. Physicians generally don’t like it, because they tend not to like business approach”, he remarks. In fact, a persistent issue seems to be a certain confusion between research and innovation. “Clinicians have much confidence with traditional research approach, but they tend to assume that research is not meant to go to the market: ideas stay in publications”. Data are definitively a central point, as opening health systems’ innovation also means opening Electronic Health Records (EHR). Are Information System Infrastructures in place ready for change? Moreover, are the large EHR vendors ready to let startups in? Perceived value seems here the answer to improve the access to medical data. A new “disease” seems to affect innovation processes in healthcare and this is piloting. All agree that we have too many pilots not becoming reality. Legal issues with a specific focus on IP rights seems to play here a major role. The model of property rights should be clarified as well as what prevents from exploitation should be identified, with a strong commitment for moving from prototype to product. Public demand driven innovation is a key issue here, according to Draoli. A kind of public declination of “b2b open innovation” should be worked out for public organizations and the market, as made up of enterprises, SMEs and startups. “Often – Draoli says – the public sector owns a deep knowledge of the problem to be placed on the market: possibility should be given, at the end of the process, to get to the concrete buying”. Working together seems the answer to many questions, but – as remarked by Pascal Lardier- in order to innovate practices and improve clinical and financial outcomes, stakeholders’ incentives should be aligned. Stakeholders’ incentives should be aligned to healthcare policies, overcoming the shortsighted “electoral approach”, according to Roberto Ascione, putting a preeminent focus on prevention. “A prevention reimbursement code, for instance, should be put in place, in order to measure and give a precise value to the prevention solutions adopted”. The issue here also links to the payment model in healthcare, based on activities and not on outcomes. Who should take the lead in opening up health innovation? The health innovation ecosystem is clearly a complex one and involves many players. In these new ways to open up health innovation, who should take the lead? “Physicians and patients must put the challenge, but it is key to ensure proper communication with providers, which are often no taking into account real challenges” Tozzi says. “Co-design could be therefore the answer”. Distributed leadership is what Andrea Damiani, co-director at KBO.com – Knowledge Based Oncology Community, Policlinico Universitario A. Gemelli stands for. “Different experiences are here involved, as doctors don’t think about product, engineers always think about product while investors think about the return. To who you give the lead, will tell you what you end to”. According to him, “we need the human interfaces we don’t have yet. Therefore next step is to empower new professionals that can be human interfaces”. “We need a new figure, not necessary a clinician, with capability to deal with and to integrate different dimensions and approaches”, according to Agostino Charavalloti, Researcher from the Department of Biomedicine and Prevention, at University Tor Vergata, Rome. Identifying a brokerage function for innovation in healthcare is also a good point for Mauro Draoli. Horizon 2020 Calls under Societal challenge “Health” should be carefully considered, according to Caterina Buonocore, H2020 National Contact Point, APRE (Agenzia per la Promozione della Ricerca Europea) as “the approach there is to enable distributed management, co-design of solutions, with an explicit reference to needs, functionalities, pre-commercial procurement, demand driven solution”. Listen carefully to physicians but keep in mind that they not necessarily know what they want. Last but not least, check our eHealth HUB Solution Match open calls, apply and get the chance to be selected.